Calling All Dynamic Astronomers: Assemble in Boulder! The AAS Board of Trustees (BoT) has undertaken a two-stage effort to update the 1996 report on graduate education. The initial effort* is focused on admissions, mentoring, and retention, with particular attention to diversity and inclusiveness in astronomy. Accordingly, at the 229th AAS meeting in Texas in January 2017, the BoT created the AAS Task Force on Diversity and Inclusion in Graduate Astronomy Education. Alex Rudolph (California State Polytechnic University) and Gibor Basri (University of California, Berkeley) are co-chairs. A complete list of members and more detailed information about the task force's charge, goals, and structure are available in a PDF. 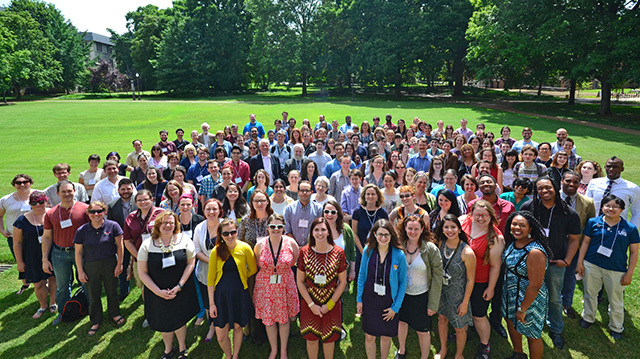 Our work builds on ideas developed at the Inclusive Astronomy meeting, national efforts across disciplines, as well as other sources. The task force is charged to develop a set of recommendations by the end of 2018 that could be adopted by departments to advance the efficacy of admissions, mentoring, and retention practices. Upon endorsement by the BoT, the recommendations then will be quickly adopted by an initial set of pioneering departments. These early adopters will set an example for the next wave of departments, leading ultimately to a large increase in the overall number of adopting departments, which will be an ongoing effort by the AAS. University in Nashville, Tennessee. Courtesy IA 2015 organizers. The recommendations will include the collection of vital data, a menu of evidence-based approaches related to recruitment and enrollment of talented and diverse graduate students, and practices leading to broadly successful graduation rates. Recommendations will be accompanied by references, resources, and suggested metrics for evaluating their success. The task force is hosting a Special Session at the 232nd AAS meeting in Denver to provide an opportunity for discussion and input by the larger community. This session, number 107, will be held on Monday, 4 June, from 10:40 am to 12:10 pm in Governor's Square 16 at the Sheraton Denver Downtown Hotel. We expect that there will also be a special opportunity at the 233rd AAS meeting in January 2019 in Seattle, where the adopted recommendations will be presented. We encourage AAS members to learn more about this task force and to contact the co-chairs or other task force members with ideas or comments. *The latter stage will concentrate on pedagogy, curriculum, and professional development.